Valhalla sans Norse pantheon, reimagined for the realities of the table? Yep, and it actually WORKS! This Demiplanes-book clocks in at 59 pages, 1 page front cover, 1 page editorial, 1 page SRD, 1 page advertisement, 1 page back cover, leaving us with 54 pages of content, so let’s take a look! So, the first thing I should note is this: I am super picky regarding my Norse lore; I have a degree in the field, can fluently read Norse, and I’m most of the time really pissed off when I see how adaptations to roleplaying games butcher the concept when trying to stay authentic. You see, the most common roleplaying games we play feature assumptions colored by the dichotomous thinking and values cultivated over the centuries, courtesy of Christianity and similar book-based religions. Without going into the finer philosophical details, a perhaps more easier to grasp analogue would be this: Do you know the “Vikings” TV-series, the one adapting Ragnars saga loðbrókar and the Ragnarssona Þáttr? I’m the annoying guy who’ll chew your ears off about the liberties taken with the source material, who’ll endlessly drone on about aspects not being correct. In my defense, I still enjoy the series, but yeah. 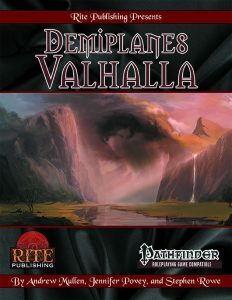 The more prudent and smarter way to adapt the concept of Valhalla, and thankfully the one taken within this book, is to distill the concept to its essence, and to create something new that takes the realities of the gaming world into account – you know, both regarding cosmology and the presence of the god-forsaken alignment system. So yeah, if you’re looking for yet another adaptation of Norse myth that will never properly fit your current campaign setting, then you won’t find that here. Instead, Valhalla is depicted as an infinite Outer Plane – one roughly associated with the Chaotic Good alignment, and one central leitmotif: Heroism. While a contextualization within a smattering of Outer Planes is provided, it should be noted that actually integrating the material presented within this pdf is rather easy – the pdf does offer some guidance and, moreover, does account for the infinity presented by the Planes. In short, we begin with tantalizing ideas of how e.g. a draconic Valhalla might look – the morphic and subjective qualities of planar reality and values are employed rather admirably and set this apart from being just another take on the classic pseudo-accurate rehashing of the concept. This theme is also emphasized by the Greater Petitioner template, which, while lacking a CR-increase note, provides regeneration in the version presented for Valhalla. The idea is obvious – the eternal fighting of the einherjar warrior spirits obviously can be undertaken by such individuals. I am not going to penalize the pdf for the lack of CR-increase here due to the limited scale of the replenishment – the ability does have a cap, preventing abuse. Now, beyond the general establishing of leitmotifs within the context of Valhalla, the majority of the book is devoted to a variety of different Demiplanes with ties to Valhalla; they all share themes in one way or another, but as a whole constitute an exceedingly smart angle, allowing, by means of compartmentalizing themes and concepts, for easy and seamless integration into the cosmology of an established game. I could e.g. integrate these into Midgard, Oerth or Golarion without much fuss. In a somewhat weird decision or oversight, the central hub of Valhalla, the grand metropolis known as “Champion’s Arena” (settlement statblocks provided) would be the only sub-section, the only one of the demiplane-like sub-sections that does not come with bookmarks. Now, as a brief glance at the respective sub-chapters immediately makes clear, the respective entries do come with secrets noted for the GM to develop, and they do make excellent use of the planar nature of the locales. In short: They offer quite a bunch cool planar traits for each of the respective demiplanes, which really helps rendering the book more useful than its premise: Each of the chapters get crunchy rules for these, with e.g. Arena’s Oathbound property providing nasty penalties for oathbreakers, while the Forge of Destiny provides for much easier crafting, but also forges the destiny of the creator, inflicting a mighty curse (no, it can’t be broken as easily as usual) that takes the concept of Wyrd, the personal destiny, and makes it a leitmotif of sorts for the afflicted. That being said, the fact that this theme is divorced from the ideological components associated with the term does render it into a potent roleplaying catalyst. On the downside, layout botched in the aforementioned forge trait, adding a single, nonsensical bullet point that then becomes a regular text. That should have been caught in proofreading, it’s pretty obvious. That being said, the traits do provide some really cool notions – in the region known as Training Grounds, for example, you can, provided you have the sufficient knowledge, conjure forth adversaries to battle, using the kenform template presented within. Similarly, there are quite a lot tables that feature e.g. alternate morphic mishaps and creature mishaps – and a table that is called “Fact of Fiction”. You see the book does feature a region called the “Unknown Expanse”, which is both every lost civilization and the yarns woven about them, but also every FICTIONAL civilization that never was! The latter is frankly phenomenal as an idea. Picture it: The BBEG is actually so smart that his plans can’t be fouled. They can’t. There is no refuge, no success possible anymore. And yet, the tale survives of a place that houses his downfall – and then, it becomes real, in a way. Of course, the same theme could easily be flipped. I adore this notion, and it is actually supported by thematic blessings for explorers and a mighty atlas that allows for basically fast travel in a tightly codified manner. So yeah, there are more crunchy bits herein than just planar geography. But before we get to those, let us talk about connections and conjunctions – the former is pretty self-evident and-explanatory, but the latter represents something we know from mythweaving all too well – basically temporary planar overlaps. Full blown manifestation of segments of the respective planes are similarly noted. Most places also note important NPCs, though these only come with fluff-information, not full stats. The cliffs of renewal allow for redemption for those with the faith to leap – once more, taking a classic image and codifying it; in the Eternal Tavern, bards can learn a new masterpiece, the First Hero’s Journey (and yes, the First Hero actually is in the bar…), and in an interesting take, this masterpiece does provide a take on the concept of the monomyth, with three stages that happen consecutively. Similarly, there is a minor artifact that does improve mythic power or make the owner count as mythic, which does come with narrative potential galore, particularly if you’re like me and love throwing mythic critters at regular characters… In the somber Gardens of Memoriam, those so inclined can live through the final moments of heroes, which once more sports narrative potential galore. A very potent mindscape-based trap and the notion of the norn’s curse/will is within these pages, while the tavern of unsung songs bestows a healthy dose of humility on the mightiest of mighty, including a rather impressive spellblight…and there obviously would the Well. A place where sacrifices can be made to gain basically any effects – but not even the gods can alter the finality of it or recover losses incurred here! Nice to for once see no divine intervention clause! Oh, did I mention that there is a creature born from former-familiar ravens, so-called exensils, which actually may choose to become familiars once more? Editing and formatting are very good on a rules-language level; on a formal level, I consider this to be only good; I noticed more hiccups than usual for Rite Publishing’s recent offerings. Layout adheres to the beautiful, new two-column full-color standard Rite uses, and the interior artworks, for the most part, are stunning, though they do not adhere to a unified aesthetic. For the most part? Yeah, the artworks are neat, but there is one really ugly CGI-piece herein. Not enough to tarnish the book, but it felt jarring to me. The pdf comes fully bookmarked for your convenience, with the weird oversight of one subchapter’s, namely Arena’s bookmarks missing. Andrew Mullen, Jennifer Povey and Stephen Rowe have created something that I thoroughly enjoyed – a planar toolkit/gazetteer full of inspiring and interesting ideas and material, a great little GM-toolkit that has appeal far beyond the concepts one usually associated with the term of “Valhalla.” Indeed, that may be the biggest strength of this pdf – the fact that it does not waste time trying to rehash bits and pieces from mythology we already know. Instead, it focuses, precisely and in an inspired manner, on how ideas can be distilled, and how they can be applied to the realities within the campaign worlds we play in. This idea suffuses the whole pdf and makes this a very worthwhile supplement to have. In short, this is exceedingly “gameable”, to use that buzz word. It also provides what definitely *is* Valhalla, without requiring the whole Norse pantheon – it is a Valhalla to customize, to make your own. You could, theoretically, make a grippli-Valhalla, for example. This pdf provides a lot of interesting ideas, both regarding fluff and mechanics, and while it does offer from a few proofing-level hiccups, that is not enough to truly tarnish it. As such, my final verdict will clock in at 4.5 stars, rounded up due to in dubio pro reo. Additionally, the exceedingly clever and versatile notion that distills the essence of the plane and makes it generally useful for various cultures and settings also means that this receives my seal of approval. You can get this cool planar supplement here on OBS!